No matter where you are at in your life; just starting out, mid career or retired, knowing where you stand financially helps you weather the storms that may be ahead. Do you have the resources to not only make ends meet today but to have the freedom in retirement to expand your horizons and do the things you’ve dreamed about all of these years? So few evaluate their finances until their checks start to bounce or they are so much in debt that they can’t dig themselves out. Many simply give up and keep spending beyond their means and live pay check to pay check. The younger generations rely so heavily on their credit and debit cards that they never know how much is really in their account until their cards are rejected for insufficient funds. Most don’t even know how to balance a checkbook because they don’t keep one! I talked with one federal employee recently that earns a good living and yet they can’t seem to get ahead. Each year their raise comes and goes and each year they still end up with huge overdraft fees that they simply accept as part of their world! It’s crazy considering that a few minor adjustments in their life along with some basic budgeting could convert their dilemma into an opportunity. This appears to be pandemic today. Being financially responsible is a necessary part of all of our lives and to go through life without knowing where you stand leads to disaster for many. When you have a good job and income many take it for granted that their good fortune will always be there for them to fall back on. That isn’t the case for life in general as many of us know from firsthand experience. You never know what may be around the corner and when times are good those are the times to sock money away for a rainy day not the time to squander what you have on transitory discretions. Sure, have fun but in moderation. It’s OK to go on a vacation and to enjoy life, however many simply don’t know when to stop having fun and get serious about their family life and financial security. Many today schedule multiple trips each and every year, between vacations they take frequent short trips, attend concerts, and are always on the go; it’s never enough. Do you know anyone like that? They don’t know how to simply “smell the roses”…, just sitting back and enjoying each other’s company, their home and family. Moderation is the key, you can’t do everything and remain sane or financially secure. Financial problems are one of the main causes for divorce today and general discontent for families overall. If individuals and couples would take a few simple steps they could determine where they stand financially and establish a realistic plan to secure their present and future life. There are easy to use online financial planning tools available along with our Retirement Cost Analysis section on our website. 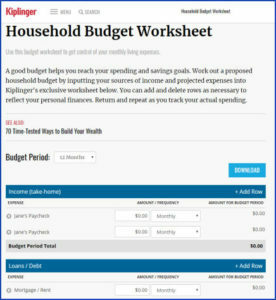 One of the easiest and useful online tools to use from my perspective is Kiplinger’s Household Budget Worksheet. I recommend the Kiplinger’s worksheet to anyone I talk to about financial planning and link to it from our website. Under insurance you can add your FEHB coverage and under investments add a line for your TSP account. If you are retired include your federal annuity and Social Security payments in the income section. After completing your entries you are able to download the results. This is an easy and painless process that you can typically complete in an afternoon. The first step is to locate your pay stubs, annuity and Social Security payment information if applicable along with copies of your various bills and bank and financial statements. The worksheet will show your total monthly or annual income in relation to what you are paying for each category. You have the ability to budget for the year, month or pay period. This is a good exercise for literally everyone and many will be surprised at just how much they are overspending is certain areas. This process allows individuals and couples to make informed decisions to cut their spending, save more, and it will reduce your stress. Also visit our Financial Planning pages for additional helpful information. I seldom use a debit card. I withdraw a certain amount each month from the bank and use that money for small purchases, restaurants, and general items. You have a better handle on what you are spending with cash. I reserve my credit card for filling up the cars and other purchases and pay the card balance off monthly to avoid interest payments. Using a debit card for all of your day to day purchases can and often leads to overspending. It’s just a card and most keep pulling it until they receive a notice of insufficient funds from a vendor. I reviewed a checking account statement awhile back from someone who needed help with a spending problem. In one month’s time that person had used their debit card over 150 times and each time an entry is posted to their account. Many of the purchases were for less than $5.00 and included debit card payments for a single pack of gum! They had no idea where there money was going and how much they were spending until it ran out. This individual had overdraft fees of $75 or more each and every month! The Bank of America hosts a Savings and Budgeting section on their website that offers sage advice and provides guidance to those establishing a budget and building their savings. Dave Ramsey is a financial guru who has helped many get their finances in order. His books make great gifts for anyone that needs guidance in this area. 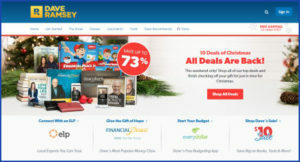 Visit his website at http://www.daveramsey.com to review his books and to locate a station near you that airs his weekly Dave Ramsey Show. Other resources are available from your broker or local bank. The individual I mentioned above visited her local bank to learn how to balance her checkbook. It’s both comforting and a relief when you have a grip on your finances and know the direction you are travelling. Many reading this column already understand these principles. If you know someone who needs help in this ares steer them to these resources, they can make a significant improvement in their lives.